← Dinner Party Secrets: Leftovers? Get Sauced! I suppose, in this day and age, that it is difficult for my readers to understand my commitment to our men and women in uniform. My father was a career Army officer in a time when that came to be a very unpopular thing. I had a marvelous childhood with tours in the Canal Zone and Holland. He had a fairly good time of it, aside from his tour in Vietnam. I’ve grown up with men and women who served this country (and it can be argued who served the world) in World War II, the Korean Conflict, Vietnam, the action in Panema, in the drug wars and in both Gulf Wars. They are incredible people who are asked to do things that the rest of us cannot fathom. And they do them on a daily basis and with little regard for personal safety and less complaint. Today, they volunteer to serve. And because they do, I am not required to serve in my Country’s armed services. Why do our volunteer forces join up? What makes them the men and women they are? Whatever your politics, please understand that our soldiers, sailors, airmen and Marines do what they do because they feel it is both necessary and honorable. Beyond that, there is a pride in serving in uniform. Serving with one’s comrades-in-arms. And in America, serving the vision that is this Country’s legacy. It is a service and sacrifce that I will never know. Here is my brother-in-law’s ode to his service Dress Blues on the day of retirement from The United States Marine Corps. I wish you could have heard him. I think it speaks volumes. As Semper Fi President you were the prize I had won. ‘Twere no medals nor ribbons to grace you then. Just a year or so removed from my first foreign fray. A new butter bar striding into his first Ball. Silver eagles on golden globes and anchors. Forged – my conviction to service both happy and stern. Found – my calling as soldier of the sea. Radiant and bright was I in this wondrous blue armor. Striving always to be worthy to put you on. No more barren chest but nigh dozen medals glitter in two row. To join buttons and EGAs that still shine bright. Why should feel the loss of you as something so monumental? Are you not, my Blues, just some cloth and bits of shiny metal? No. No mere garment or vain symbol are you. Blest, blest, thrice blest to number among those chosen few. ‘Tis a joy and legacy I’ll cherish all my days. I feel joy for my new future but your loss to me’s a dart. This great chapter in my life’s come to a close. Causing some grandchild perhaps to wonder and dream. You will still hold sway. 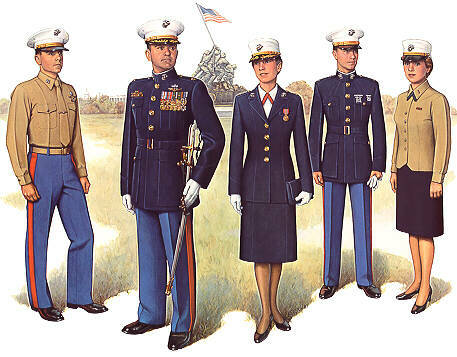 This entry was posted in Elegantology and tagged clothing, Elegantology, military, uniforms. Bookmark the permalink. I served with Fred in the first Persian Gulf War. 2nd Recon. This poem exemplifies his intellect and eclectic personality. One minute its Harley Davidsons the next its a rich tenor singing O Holy Night. If you would please forward my e-mail address to him. I would like to catch up with him.